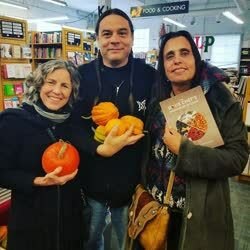 In his lecture, �The Evolution of the Indigenous Food Systems in North America,� Sherman explored the regional differences among various indigenous cultures from around the continent, noting that each area�s geography � coastal, swamp, desert, forest � led to distinctive approaches to food. One of NATIFS� outreach efforts aimed at helping restore those lost food systems is the Indigenous Food Lab � a restaurant, education and training center in Minneapolis, set to open in the coming months. �The best part of these indigenous diets is their health benefit, because you get an immense amount of plant diversity,� he said. �It�s a super-low glycemic diet,� which can help to address some of the health issues � diabetes, obesity, heart disease � that plague Native Americans. Sherman�s visit to Cornell was co-sponsored by the American Indian and Indigenous Studies Program and the Atkinson Center for a Sustainable Future. Along with Cornell Botanic Gardens, these organizations share an understanding of the importance of indigenous food systems to the health of people and the planet.